Over the past few days the LA Daily News misrepresented LA Animal Services on two occasions. The first instance was an article by Rick Orlav entitled, “Valley’s horse-rescue plan needs work”. While I’ll agree that all emergency response plans need to be subject to constant review and improvement, the article suggests LA Animal Services’ role in the Sayres Fire is not clearly understood. LA Animal Services was there. LA Animal Services rescued over 400 horses. However, no mention was made of the fact that LA County Animal Care & Control was a no show until the rescue effort was nearly complete. The only confusion during this entire episode resulted from whether LA Animal Services should go into the County to rescue horses outside of our jurisdiction or wait until County Animal Care & Control arrived. When it was clear horses would be lost if we didn’t act quickly, we of course went in – and as a result no horses were lost. I made the recommendation to include a representative from Animal Services in the Emergency Operations Center to Councilman Dennis Zine nearly two years ago but to date he has taken no action and seems unaware of LA Animal Services critical role in these matters. LA Animal Services performed exceptionally well and effectively saved hundreds of horses. They should be recognized for this heroic achievement – not criticized for the shortcomings of another department that couldn’t even get there on time. The next article was an op-ed piece that appeared a few days earlier. I understand editors apply less scrutiny to want-a-be reporters, but LA Animal Services is such an open book that at any time the Daily News could simply have made a phone call to verify the facts before propagating the malicious myths manufactured by a chronic critic. I refer to the piece entitled, “Finally, the end of an Ed Boks era.” The author suggests LA Animal Services is somehow broken and “spiraling out of control” and the only remedy is to follow his inexperienced advice. So, is LA Animal Services broken? Let’s look at the facts. Keep in mind this partial list of accomplishments was achieved while the Department experienced its most historic growth and most severe budget cuts and staffing shortages simultaneously; a significant challenge for any manager. Still, we built the highest volume pet adoption program in the nation; achieved the lowest euthanasia rates in the Department’s history; opened six LEED (Leadership in Energy and Environmental Design) Certified animal care centers; increased staff size 100%; and recruited a record number of volunteers. We firmly established the Animal Cruelty Task Force; improved Pet Shop and Circus Animal Regulations raising the standards for humane care; formed a coalition of over 100 animal welfare organizations to enhance our adoption efforts; produced two animal welfare television programs, and established an exceptional veterinary medical program and executive team. Not only is LA Animal Services not broken, it is better positioned than ever to help establish LA as the most humane city in the nation. If you would like to be part of a winning team please consider volunteering with LA Animal Services and/or by making a donation to one of LA Animal Services life-saving programs. That is the question being debated in Beverly Hills this month. The debate officially began on Wednesday, July 1st, when a 65-year-old Feral Cat Colony Manager named Katherine Varjian appeared before a judge in the Beverly Hills courthouse charged with the crime of feeding feral cats. While I am sure no one in Beverly Hills wants to outlaw compassion, it should be understood that criminalizing the feeding of feral cats does just that. Although municipalities may deliberately or inadvertently outlaw compassion by ordinance, they can never stop it. When compassion is outlawed compassionate people will turn outlaw before denying their better angels. Ms. Varjian may be a case in point. Surely this commitment and this case present a unique opportunity for the City of Beverly Hills to expand the circle of compassion to include feral cats. What Are Our Choices: Communities typically employ one of three methodologies to deal with feral cats: 1) Do nothing, 2) Eradication, or 3) Trap/Neuter/Return (TNR). While it is easy to understand why doing nothing has little effect on reducing feral cat populations (and, in fact, encourages growth), it may not be as easy to understand why eradication does not work. Although some communities continue to employ eradication (“do not feed” “catch and kill”) as a remedy, decades of eradication efforts in communities across the United States has irrefutably demonstrated that this methodology does not work. There are two very real biological reasons why eradication fails every time. Wild animals tend to have strong biological survival mechanisms. Feral cats, which are wild animals, typically live in colonies of six to twenty cats. You often never see all the cats in a colony and it is easy to underestimate the number of feral cats in a neighborhood. When individuals or authorities try to catch cats for extermination this heightens the biological stress on the colony. This stress triggers two survival mechanisms causing the cats to 1) over breed, and 2) over produce. That is, rather than having one litter of two to three kittens per year, a stressed female could have two or three litters per year of six to nine kittens. Even if a community was successful in catching and removing all the feral cats from a neighborhood, a phenomenon called “the vacuum effect” would be created. When some or all the cats in a colony are removed, cats in surrounding neighborhoods gravitate toward the ecological niche vacated. When a colony is removed but the natural conditions (including food sources) remain, the natural deterrents offered by an existing colony of territorial cats evaporate and the neighboring cats quickly enter the newly open territory, bringing with them all the associated annoying behaviors. As we’ve seen time after time in location after location all over the country, the end result of the “catch and kill” methodology is always the same: The vacated neighborhood quickly finds itself overrun again with feral cats fighting and caterwauling for mates, over breeding, and spraying to mark their new territory. “Catch and kill” never provides a lasting solution and can easily exacerbate the problem. Albert Einstein defined “insanity” as doing the same thing over and over again expecting different results. That is why so many communities are abandoning the failed “catch and kill” methodologies in favor of trying the newest and only humane, non-lethal alternative: TNR (Trap/Neuter/Return). 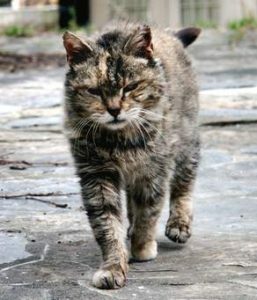 While I was in Maricopa County, TNR was so successful that the County Board of Supervisors enacted a resolution declaring TNR the only viable methodology they would approve for addressing the feral cat problem in this County of 24 cities and towns (including Phoenix) spread out across nearly 1,000 square miles. While in New York City, we observed a 73% reduction in the number of stray cats impounded in a targeted zip code on the Upper West Side of Manhattan over a 42-month period of practicing TNR. TNR, correctly administered, is the only methodology that guarantees a reduction of the feral cat population in a community. When TNR is employed effectively, all the feral cats in a neighborhood are trapped, sterilized, and returned to the area where they were trapped. They are returned under the care of a Colony Manager. The Colony Manager is a trained volunteer in the neighborhood willing to feed, water, and care for the colony and watch for any new cats. Once the colony cats are all neutered, new cats tend to be recently abandoned domestics that can be captured and placed for adoption. Ms. Varjian is a Certified Feral Cat Colony Manager; trained and certified by Dona Cosgrove Baker, President and Founder of the nationally recognized Feral Cat Caretakers’ Coalition. There are many benefits to TNR: 1) TNR prevents the vacuum effect from occurring. 2) TNR dramatically mitigates the troubling behaviors of intact cats: fighting and caterwauling for mates, and spraying for territory. 3) Altered cats provide rat abatement, a service many neighborhoods value, such as the Flower District in Los Angeles, and 4) because feral cats tend to only live one-third their natural life span the problem literally solves itself through attrition, provided TNR is implemented community wide. TNR also addresses the concern that feral cats tend to create a public nuisance on campuses and in parks. There is an old adage that claims you can’t herd cats. In fact, you can herd neutered cats because they tend to hang around the food bowl. Because neutered cats no longer have the urge to breed and prey, they tend to follow the food bowl wherever the Colony Manager takes it. Feral cats can be trained to congregate in campus or park areas out of the way of the public or other wildlife. When you review LA’s statistics it is clear that free-roaming cats represent our biggest challenge to achieving No-Kill. Nothing hinders Beverly Hills from joining the City of Glendale and other communities who have already embraced TNR. It is my hope that Katherine Varjian’s case will open the door to a deliberative dialogue on the effectiveness of TNR for our residents, our wildlife and our feral cats. Citizens interested in voicing their opinion on this matter can attend the next Beverly Hills City Council meeting where the question of reinstating a prohibition on feeding feral cats will be reconsidered. The question is much bigger than feeding or not feeding feral cats. The question that needs to be answered is, can we as a community come up with a humane, non-lethal solution to our feral cat problems. I believe the answer is a resounding “Yes”. The next Beverly Hills City Council meeting is scheduled for Tuesday, August 4th at 7 p.m. at the Beverly Hills City Council, Rm. 400 (Council Chambers) located at 455 N. Rexford Drive, Beverly Hills, CA 90210.